How Should I Vote for November 6? US Senate: No endorsement. 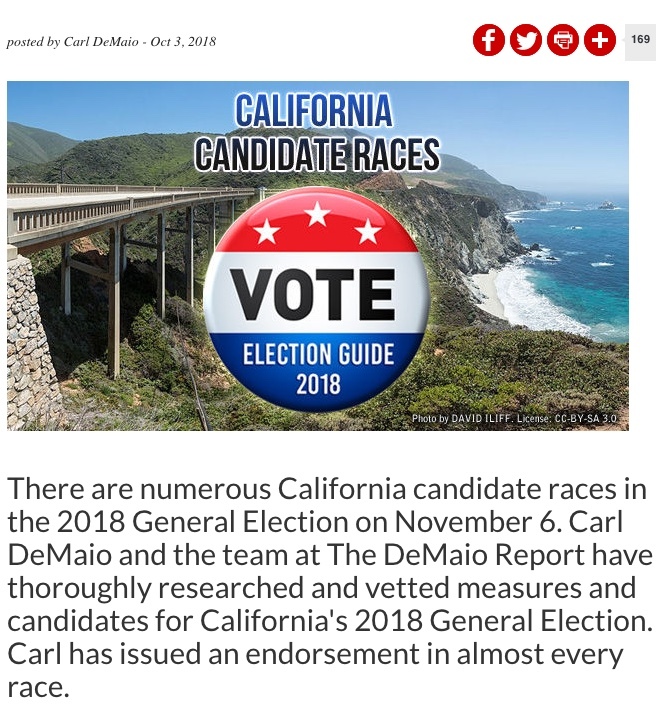 But DeLeon would be WORSE than Diane Feinstein. Congress – District 11: No endorsement. Congress – District 26: Antonio Sabato, Jr. US Congress – District 50: No endorsement. State Senate – District 18: No endorsement. State Assembly – District 26: No endorsement. State Assembly – District 42: No endorsement. State Assembly – District 76: No endorsement. State Assembly – District 77: No endorsement. Brian Maienschein has been a disappointment. Californians already owe billions in debt for bonds, but have seen little accountability for the funds. Throwing money at the problem will not solve our affordable housing crisis. Moreover, this bond supports government-subsidized housing projects that come with costly strings attached. More housing bonds – this time with different window dressing added by sneaky politicians. What happened to the last multi-billion dollar worth of water bonds? None of the money was actually used for water projects to improve delivery of water for human consumption. Want a water fix? Don’t borrow, just change the crazy regulations that the environmentalists have imposed that has cut the water supply off. More borrowing, more debt when we can’t afford the existing state debt service. Plus these bonds come with costly strings attached – government mandated union wages. A common-sense way to expand the benefits of Prop 13 protections – resulting in more affordable housing! Prop 6: Gas Tax Repeal YES YES YES! While this measure won’t officially end daylight savings time, it allows a public process to do it in the future. A shameful union ploy to force healthcare workers into union membership they don’t want and can’t afford. Rent control has a good sounding name, but this initiative will result in higher housing prices for all – particularly the low-income families who rent versus buy. Perfect example: San Francisco has some of the toughest rent control mandates on the books, but the highest housing prices. Rent control does the opposite of what proponents claim they are seeking. Want more affordable rents? Cut government regulation and build, build, build! Unions are trying to impose costly mandates and fees on our ambulance system at a time when patients can barely afford health coverage. Why should an ambulance ride cost $800 to $1000?Let’s enact some common-sense reforms with this initiative. We all love animals, but some groups are just too extreme and crazy on this topic. They hate any human consumption of meat. This initiative would impose overly-restrictive and costly mandates that YOU will end up paying for with your grocery bill.